Getting Wrecked provides a rich ethnographic account of women battling addiction as they cycle through jail, prison, and community treatment programs in Massachusetts. 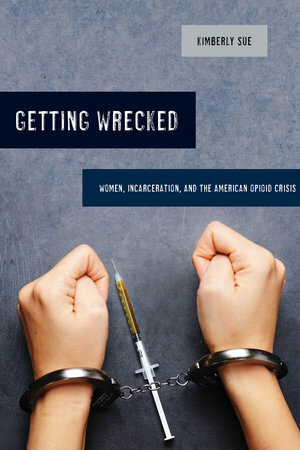 As incarceration has become a predominant American social policy for managing the problem of drug use, including the opioid epidemic, this book examines how prisons and jails have attempted concurrent programs of punishment and treatment to deal with inmates struggling with a diagnosis of substance use disorder. An addiction physician and medical anthropologist, Kimberly Sue powerfully illustrates the impacts of incarceration on women’s lives as they seek well-being and better health while confronting lives marked by structural violence, gender inequity, and ongoing trauma. Kimberly Sue is the Medical Director at Harm Reduction Coalition, a national nonprofit organization working to improve the lives and health of people who use drugs. She completed her medical training at Harvard Medical School and graduate anthropology training within the Department of Anthropology at Harvard Graduate School of Arts and Sciences. She completed medical training at Massachusetts General Hospital in internal medicine, with a focus on primary care and addiction, and has ongoing interests in incarceration and improving the health of people who use drugs.